A cracking Christmas show stopper! Our Santa Stop Here Light Up House is the essential Christmas table decoration this year. There’s no need to assemble, simply pop out of the box, neatly push the lights through the pre-cut holes, switch on and delight your guests this Christmas. Make your own nativity scene the little ones will adore this year with our handmade metal Christmas house. With bright festive colours and a small wreath with tiny baubles, this timeless decorative piece is the perfect way to bring a traditional Christmas theme into your home. Our unique products are of the highest-quality and will look fantastic for many more years to come. Creat a festive lit village. Part of our Dutch Village Collection. 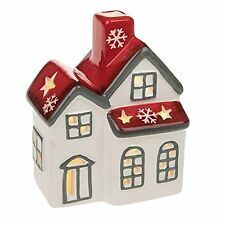 Ceramic LED Lantern - Christmas House. Can I have my order faster?. Battery Included. Gifts for Kids. Gifts for Her. Gifts for Him. With Santa or Snowman on roof. Christmas Decoration Silver and White Battery Flashing LED House. Contains Flashing & colour changing lights. Novelty Light up House. Battery Operated (Included). Silver & White with glitter detail. Size 29cm High. Decorated Glass Bottle. Christmas room decoration. 10 Warm White LED's. Battery Operated. Can I have my order faster?. Calendars / Diaries. Requires 3 x AAA Batteries (Not Included). Lemax - Linden Tree. All our Lemax village accessories are very collectable and made with great detail. tart a family tradition with our new Lemax Village Collection! Perfect for Fairy and Miniature gardens. All our Lemax Spooky Town village accessories are very collectable and made with great detail. Lemax - Winter Tree. tart a family tradition with our new Lemax Village Collection! Perfect for Fairy and Miniature gardens. The cardboard is printed both sides in vibrant colours so it looks good from all sides. Honeycomb paper base. Material: Card and paper. Main Features. A great addition for christmas. Large Lit LED Rustic Wooden Festive Village House with Fence Xmas Decoration. Beautiful detail, showing winter Xmas scene. Size – 39 cm x 33 cm. Can be used inside or outside. CAN BE FREE STANDING ON A SIDEBOARD ETC. Candle Bridge Size: 32cm. Sitting on a wood base with Houses that light up too. Pine Wood Bridge with 5 Candle Lights. Can I have my order faster?. Requires 2 x AA Batteries (not included). Warm White. Natale ELFO NATALIZIO MINI PORTA ROSSA Battiscopa Casa Ufficio Decorazione 5"
Ideal For The Skirting Board Door Or Windowsill. Christmas Elf Fairy Door. This product will be adored by children throughout the festive period. Gingerbread Xmas LED House. Gingerbread House LED Light Up Lantern. Imagination brought to the life in the form of a light up Gingerbread House. Add some vintage charm to your Christmas décor with this handcrafted wooden house complete with thick twine for easy hanging. This original product with a festive green and red design can be displayed throughout your home as a fun decorative piece or gifted to a shabby chic loving friend. - - New to our range of wall displays, Fibre optic lit scene of a country house - Surface scratch water resistant, Battery powered - Using branded alkaline batteries the firbre optic lights can last upto 300 hours A perfect way to brighten up a wall - A perfect way to brighten up a wall, Ideal gift - Product Dimensions: 40cm x 30cm. Beautiful detail, showing winter silhouette scene. Creat a festive lit village. Part of our Dutch Village Collection. Ceramic LED Lantern - Town House. Can I have my order faster?. Battery Included. Gifts for Kids. Gifts for Her. Gifts for Him. Personalised Engraved 3D Light-Up Xmas House Christmas Decoration. A beautiful, personalised 3D light-up Xmas house Christmas decoration. The house is designed to hold a battery tea light candle which gives a lovely glow effect in low light. LED House With Fiber Optic House. Warm White. LED multi-coloured. 18 x 11 x 14cm. Contains Flashing & slow colour changing lights. Battery Operated. Novelty Light up House. Requires: 2 Button Batteries AG13 (Included). Can I have my order faster?. Disney / Character. Suitable for indoor use only. - COACH HOUSE VINTAGE CREAM MUSIC PAPER HEART - BDA005 - Coach House - Vintage - Cream Music Note Design - Paper Heart - 300mm x 350mm - BDA005. - COACH HOUSE WHITE FLUFFY HANGING OWL - JSM423 - Coach House - White - Fluffy Owl - Hanging Decoration - 100mm - JSM423. - COACH HOUSE SMALL NATURAL GRAPEVINE CAGE - MJF043 - Coach House - Vintage - Small - Grapevine Cage - MJF043. - COACH HOUSE CREAM HANGING OWL - JYA020 - Coach House - Cream - Hanging Owl - 70mm - JYA020. - COACH HOUSE BROWN FEATHERED BIRD ON CLIP - RSB2158 - Coach House - Brown Bird - Feather - Clip on - RSB2158. Illuminated by 8 warm white led's this wonderful wooden village scene features a church and 3 houses. Pre-Lit Wooden House Village Scene, 45 cm. This set features eight pre-lit warm white LED lights in the houses and church to provide a warm glow. Daddy deer appears to be missing his tail. Primark Harry Potter Christmas Baubles.